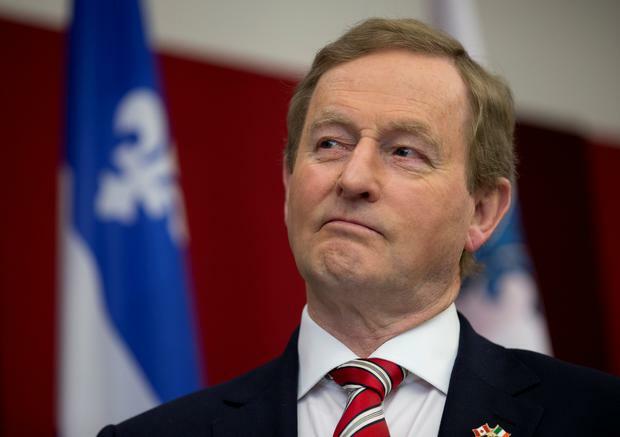 TAOISEACH Enda Kenny has said the issue of his leadership and the future of Fine Gael are not up for discussion while he is abroad on trade missions. But he said he has not changed his mind in relation to his plans to step aside and that he has made this point known to his parliamentary party. Mr Kenny said he travelled to Canada to focus on trade and investment - not his intentions to step aside. The Fine Gael leader yesterday hit out at media questions on his leadership. "I can't believe actually that you have travelled this distance to ask a question like that," Mr Kenny said during a press conference with Canadian Prime Minister Justin Trudeau. But the Taoiseach was asked again about his intentions to step aside at a press briefing with journalists in Toronto on Friday. He rejected suggestions that he took "umbrage" when he was asked about the issue yesterday. "Well now for your information, I didn’t take umbrage at all," Mr Kenny said. "I came here on a trade and investment mission to meet with the Canadian Prime Minister to discuss the opportunities of CETA that work both ways. That’s the purpose of my visit. And I don’t intend to discuss the question of leadership or the future of the Fine Gael party when I’m on a trade mission or investment mission to Canada," he added. "Matters of Fine Gael are internal to Fine Gael. I’m here officially on a trade and investment mission to Canada. And I don’t propose to discuss anything to do with leadership when I’m on this trade mission." "No, I’ve been very clear with my parliamentary party about this."